No other side in League One has kept as many clean sheets as Blackpool this season but that doesn’t stop defender Ben Heneghan wanting more. The Seasiders’ stalemate with Shrewsbury Town on Saturday made it 13 shutouts for the season and two on the spin, having denied leaders Portsmouth in their previous fixture. 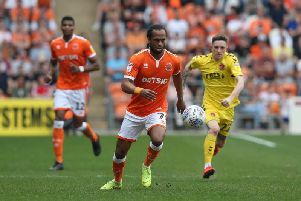 Blackpool’s issues have come at the other end of the pitch, with Terry McPhillips’ men failing to score in five of their last seven. Heneghan admits Blackpool need to show more quality in the final third but it’s not the only area where the 25-year-old wants more. The Sheffield United loanee said: “As a defender you take a clean sheet every day but we just lacked the quality (in attack) and it wasn’t the greatest game to watch. “It’s hard to play on that pitch. It’s not in good condition but we’ve just got to do better. “We didn’t create many chances but we never really felt threatened, so at the back it was fairly comfortable. “But we’ve got to create something. We’ve got to fire the ball across the box or something to put them under pressure but it just didn’t happen. “We were told at half-time that it wasn’t good enough and that we had to test the keeper as there hadn’t been any shots on goal, which is definitely not good enough. “I suppose we’ve just got to take the positives, which are the clean sheet and another point. “As a defender you pride yourself on clean sheets and I want to keep as many as possible. I want more than we’ve got now, so every week that’s what we look for. Pool have kept those consecutive clean sheets with Christoffer Mafoumbi in goal in the absence of injured number one Mark Howard. “It’s what we expect from Chris,” Heneghan added. “He had to be ready when the chance came his way and it’s two clean sheets in a row now. “We’ve got a good group. We see it in training and it’s just a case of taking it into games. “There’s a lot of competition and it’s cruel in that people get pulled out of the team, but that’s just the way football goes unfortunately. “It’s a big squad and there are quite a few missing out altogether, so we’ve just got to keep everyone on their toes and keep fighting.